From the classic military bayonets to the Zombie series we have an abundance of different fixed blade knives that can suit almost anyone needs whether that be hunting, law enforcement or displaying. Canada’s source for Fixed blade knives! 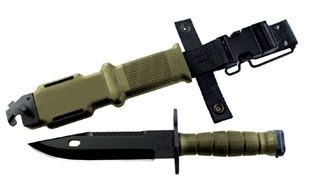 The 12 1/4 inch genuine US Army issue 493 M9 bayonet by OKC features a 7 inch, black oxide non-reflective finish, 420 modified stainless steel blade, with milled saw teeth on the back. The M9’s black handle is made from textured thermoplastic nylon. The scabbard, also made from black thermoplastic nylon, is equipped with a quick release military holster which quickly releases the scabbard from your belt, the Bayonet and Scabbard connect together to form a wire-cutter.